In most public gatherings, people need protection against rain, sun or wind. The law requires any type of covering used to be flame-retardant. For this reason, silver fire retardant tarps would be a good choice to serve this purpose. In addition, they can also be used in a construction site to protect building materials, equipment and supplies in case of an outbreak of blazes. This is important especially when the workers are not around. Any tarp used to protect items against flames need to be certified by the state fire marshals. This is after undergoing vigorous tests by various agencies. The state through its professionals gives the final certification after a test by an independent body. Construction site materials like cement, wood piles and electrical equipments are prone to damages by water, mildew, sun and others. Workers can use silver tarps to shield them from these elements. Those using flammable chemicals can also use these for their protection. In addition, when going camping or covering your car or goods in a free market, this fireproofing is necessary. Use of this material will give you peace of mind that you are safe, together with your property. Other than protection against flames and other dangerous weather elements, the canvases are also treated with uv protection. 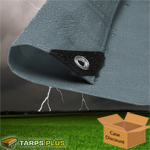 It is good for users to know that these kinds of tarpaulin are very strong and durable. One is assured of their long service when they buy them. Besides, flame resistant materials also reduce static forces. This is why they are suitable for covering boats and cars. Those using silver fire retardant tarps in a public gathering enjoy not only ensured safety against flames but also a cool environment. This is because the reflective properties of the metal keeps the sun rays, and hence heat away. It also makes a good choice since the silver fire retardant tarps meet the government requirements to ensure safety of its citizens. Most fire marshals will require a CPA I – 84 specification. If tarps are being used in a public area. Some may only require the 701 standard.